Luxury mountain retreat LOGDEN Lodge is the fruit of a lifelong dream and ambition. After traveling the world professionally for many years, we were looking for a place to enjoy the quality of life in a stunningly beautiful natural environment which we could share with others. When we walked up the path that led us to these 42 acres of densely forested private land at the foot of the Selkirk Mountains during the summer of 2012, we knew instantly we found what we were (and our future guests would be) looking for. When you stay with us you will join us in our new adventure as freshly established lodge owners. To us you’re not a customer, you are our guest, in the true meaning of the word. The four rustic looking luxury cabins that await you were designed and built with purpose. Guided by our motto “living the nature of things”, each cabin is nestled in their own private and natural surroundings. The four rustic luxury cabins are nestled in their own private and natural surroundings, giving each cabin its own unique, cozy and distinctive feel. They are richly and comfortably furnished with custom built rustic wooden cabinetry and furniture, antiques and art. 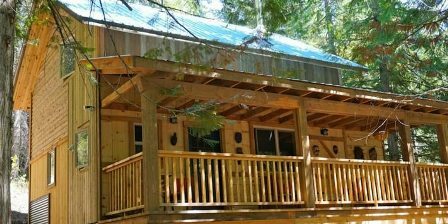 The cabins are eight-hundred square feet in size, have private, spacious, covered veranda, a loft and sleep up to four persons. Designed differently inside & out, the facilities in each cabin are similar. Step into your vacation home and you will appreciate a unique experience behind every door. Elise Cabin lies right next to and is named after our own pristine Elise creek. The creek runs year-round so no matter when you prefer to visit us, you’ll get to enjoy the soothing sound and view of the creek from the cozy warmth of Elise Cabin or your private veranda. The Heritage Cabin is closest to the main building. With its private setting this rustic luxury cabin provides sunshine throughout the day not to mention a peak view of the mountains when relaxing on your spacious veranda. 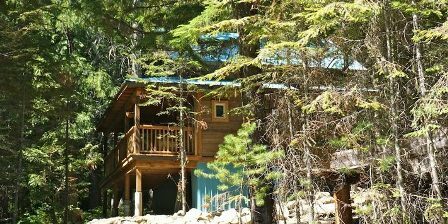 Cottonwood Cabin is the most private, secluded and furthest away from the main lodge. 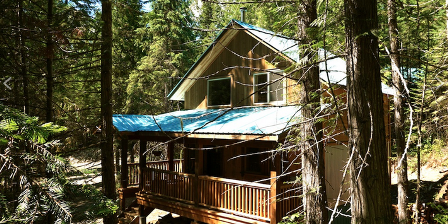 The cabin has two veranda’s, the largest of the two designed to enjoy the spacious natural surroundings and Elise creek. The Gold Cup Cabin lies next to the old mine road that leads to the once prosperous gold mine Gold Cup. The cabin stands high up the slope of the mountain to grab the gorgeous view of the mountains. 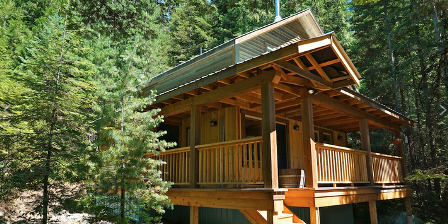 Experience the secluded-in-the-woods feeling while staying in this cabin. A retreat at a luxury mountain lodge. Tucked away on 42 acres of private forest bordering a boundless expanse of pristine backcountry wilderness, Logden Lodge is the retreat to host retreats. The combination of carefully designed luxury cabins, uncompromising service, privacy, absolute comfort, with real mountain adventures will leave your team and guests with memorable experiences. We host our own signature retreats & we look forward to host yours. Logden Lodge Signature Retreats - Together with talented women professionals from Ymir, who each in their own way share their believes & knowledge with others, we are currently hosting a series of Wellness Retreats and Writer's Retreats. Host Your Retreat - We gladly help you plan & organize your retreat with us. A corporate retreat or event, a private party, fundraiser, or a wedding, just let us know your interests & we will arrange it for you.